(AINA) — Six Assyrian organizations have issued a statement addressing the human rights violations occurring in areas controlled by the PYD Kurdish party in Syria (AINA 2015-11-02). The statement focuses on three areas of concern: illegal seizure of property, forced conscription and threats, pressure and targeted killings. The statement was signed by Assyrian organizations from Germany, Belgium, Sweden, Australia, The united Kingdom and the United States. We, the undersigned organizations, have received information from locals and community leaders in north-east Syria informing us of systematic human rights violations directed against vulnerable communities.The area in question is under the self-proclaimed rule of the Syrian Kurdish political party Partiya Yekitiya Demokrat (PYD) and is under the military control of its armed wing, the YPG. These human rights violations are primarily directed at those communities, groups and parties that have not fully embraced PYD rule. They have taken a disproportionate toll on the Assyrian people. The systematic violations are multifaceted in their nature. We chose to focus on three key issues in this statement. The self-proclaimed autonomous administration controlled by the PYD issued a decree on 15 September announcing its intention to seize the property and belongings of persons who are no longer in the area it controls. If implemented, this decision will affect Assyrians and other minority groups severely. The arbitrary confiscation of property runs contrary to the same international human rights standards that the self-proclaimed administration has staked its reputation on upholding. The self-proclaimed administration has on several occasions directed its armed forces to forcibly conscript members of the Assyrian community for military service in the YPG. This has caused many young Assyrian men to flee the area, further draining the human resources of this beleaguered community and creating fear and suspicion. Threats and pressure are also directed towards minority institutions and leaders who refuse to submit to the will of the self-proclaimed autonomous administration. The attempt by Assyrians to organize their own security to provide for the needs of their community following the withdrawal of government forces from Khabur has been met with pressure and even hostility, attested to by various eye-witness accounts, by the PYD and YPG. David Jindo, commander of a local Assyrian self-defence force in the Khabur area, was killed by assailants known to be members of the YPG militia on 22 April of this year, and his colleague Elias Nasser was badly injured and left for dead in the same attack. Our concerns have been relayed to representatives of the PYD on several occasions, most notably during a meeting held in Brussels on July 28 between our representatives and PYD representatives, including Saleh Muslim, the co-chair of the PYD. It is with great sorrow and anxiety that we witness the PYD’s aggressive policies towards Assyrians and other minorities, especially given the lofty ideals that accompanied the declaration of the self-proclaimed autonomous administration by the PYD in late 2013. Prominent among these ideals was the granting of not merely religious but ethnic rights, an aversion to tyranny and coercive centralized authority, and an emphatically expressed belief that communities should be allowed to develop their own administrations in line with their own needs. These principles were intended to justify the consolidation of Kurdish dominion in Hasaka and convince non-Kurdish communities of the democratic nature of the PYD. We denounce the continued attempts of the PYD to divide and rule the Assyrians in Syria. By financing and propping up certain individuals and groups like the Assyrian SUP party and its armed wing the MFS, the PYD attempts to give the impression to the world that it has established good relations with all of the Assyrians in the areas it controls, and not merely with the political and military groups directly under its control. Events and testimony have made it clear that the picture is significantly more complicated. 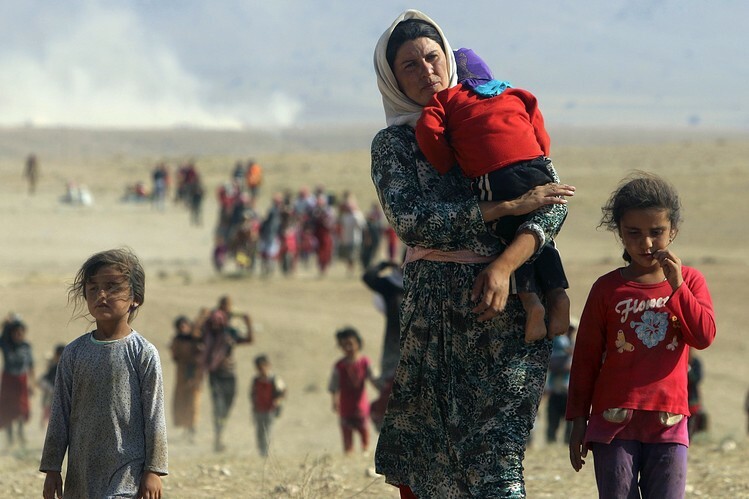 Criticism of the actions of the PYD has come not only from Assyrian organizations and other groups focused on the Middle East, but also from respected international NGOs such as Human Rights Watch and, most recently, Amnesty International. We call on the international community, leaders, journalists and human rights organizations to hold the PYD to account for its actions. In particular, we call upon the government of the United States of America, as the main supporter of the PYD, to look into the treatment of Assyrians and other vulnerable populations by its partner on the ground. PYD has gained some international attention in its fight against ISIS, a fight which Assyrian fighters have joined, but it has been accused by Human Rights Watch of massive violations of human rights, extending to forced evictions and the destruction of homes and property of non-Kurdish populations in regions under its control. “The Legislative Council of Kurdish Self Governance passed a law on Tuesday, September 15, regarding management and protection of funds of emigrants and absentees, including residential and commercial properties and agricultural lands returned to emigrants and displaced proprietors away for more than a year. This law caused an outrage and resentment among the Syrian Island’s population – especially Assyrians of all denominations and subgroups. This law comes after a series of laws issued by this Council, which greatly supported the Kurdifiction efforts in the region. This law also led to increasing the tension and rift among the subgroups of the Syrian Island community, at a time when we desperately needed unity and cohesion. However, it escalates national and sectarian strives as well as conflicts, which will have dire consequences and will negatively affect all parties.Taking any unilateral steps to determine the fate and future of the Island -which is distinguished by its national and religious diversity – is taking advantage of the situation and imposing a policy of de-facto power. Ittakes us backward to dictatorship and single-party rule eras, which exclude and marginalize other participants. The leaders of Kurdish Self Governance so far have not been able to persuade all the subgroups of the Syrian Island community- including various political, national and religious institutions -to join their administration. The administration failed to convince the Syrian Island’s people, despite the importance of having such organization, especially in light of the administrative and security vacuum in the region. That came as result of unilateral decisions that did not promote national unity nor contributed to laying good foundations for a cohesive society. In addition, the administration imposed its vision in forming this organization without really leaving room for any actual input from other participants from the Syrian Island. The administration also did not take into account the ratio of society classes. Having some people from other subgroups at the self-governance institutions, does not negate the absence of other major players -Arabs, Assyrians and Armenians. Even among the Kurds themselves , where other Kurdish parties see “self-governance” as a unilateral and exclusionary project. The participation of some other players remains just a political fa9ade without real support or mandate by the people. In fact, it was found that “self-governance” is nothing but a project to secure power, obtain profits and benefits. The project is not the democratic, pluralistic and harmonious effort that we all want. Harmed the most by this law are our Assyrian people with all its subgroups. Our Assyrian people suffered the most becaus1 of their high rate of immigrants and displaced proprietors due to persecution they faced -publicly, secretly, barbarically and systematically – such as this law and many similar regulations. In addition, all our people’s properties are located within the control of the Kurdish Self Governance. The enforcement of this law is a continuation of a series of oppressive actions against our people by successive ruling regimes. Such laws will lead to plucking our roots out of the area. This law, which disregards all legal, logical and ethical criteria, pushed many of our people to sell their properties and possessions in Al Malikiyah, Al Qahtaniyah, Al Qamishli, Al Darbasiyah, Amuda, Ras Al Ayn and Khabur at very low prices, fearing they would be confiscated, since the incidents of property confiscations greatly increased. How much worse would the case be after legalizing these confiscating acts by this law? The Assyrian Democratic Party calls upon all our institutions -political, national, religious, social and legal, to stand together condemning and rejecting this law, and to form a united front to confront and annul such laws. This law has serious political consequences for the existence of our people in our historical regions. We have to abolish previous and subsequent laws, which violate our rights and our identity – nationally, culturally, economically, politically and socially. We also call upon our institutions abroad, through our media organizations, to highlight the dire consequences of this law, and to communicate with global human rights organizations to prevent it from becoming a reality. This law creates a precedence in the history of repressive and illogical practices. This entry was posted in Featured News, News and tagged Assyrian International News Agency, Kurdish Self Governance, PYD, Syrian Island, YPG by Orthodoxy Cognate PAGE. Bookmark the permalink.